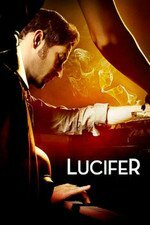 When Lucifer discovers his ex-fake-wife, Candy, has gone missing, he hightails it to Las Vegas with Ella in tow. Meanwhile, Chloe is upset that Lucifer left on her birthday, so Linda tries to lift her spirits. That was Tom Ellis singing? I always assumed they dubbed his stuff. Not bad at all. I had the same question about his song and Candy's. Whether that was her singing or not, I'd be more than happy to see the character pop up again. Chloe and Dr. Linda's storyline didn't make much sense (The doctor can take off in the middle of the day. Chloe and Dan don't bother to spend Chloe's birthday with Trixie, or even check in on her at all and instead fall asleep drunk at Lucifer's, etc.) Normally I like the odd pairs on this show, so Chloe and Linda, and Lucifer and Ella should have been right up my alley, but somehow both missed the mark. Maybe because both pairings were in situations where they were forced to react to what was going on rather than just reacting to each other. I liked the pairings more than you, I think, but I am still past ready for Chloe to learn the truth. I just don't think it makes narrative or dramatic sense to keep her in the dark at this point. It's not gonna make me quit watching or anything but it is a nagging annoyance in my brain. Sadly, my guess is that CHLOE LEARNS THE TRUTH!!!!!!!1!! !1!111 is the season ender this year. That's how I read the story they're showing anyway. OK so no has mentioned Ella talking about "quieting the voices." While it might be that she is struggling with mental illness, in the context of the show I wonder if she'll turn out to be some sort of prophet or otherworldly figure. On Supernatural there was a character who could hear "angel radio" and this strikes me as possibly being a similar situation. This episode annoyed me because it really didn't go anywhere. Most of this stuff was already covered. I mean finding out more about Candy and Ella was nice, but the Chloe/Linda/Dan storyline was extremely boring. I think it's your second option, miss-lapin. I doubt they'll go with a mental illness storyline, but given that they've made her so spiritual and open to religion, I'm betting their setting her up as receiving/having received heavenly (or demonic) voices. I think it's likely that she talks to and hears people who have died. It explains her profession, and I think in one episode she was talking about deceased people whose bodies were in her care, and demanding they be treated with respect. I don't think I realized until this episode how rarely Lucifer calls people (other than Mazekeen/Maze) by their first names. Miss Lopez. Detective. Doctor. Brother. He does call Dan "Daniel" although nobody else does. I'm pretty sure he rarely refers to Trixie as Trixie. But he has no trouble calling Candy by her name. Affectation? Way of maintaining distance? I just hate the whole "someone doesn't know the big secret" trope. Hate it. The better shows these days blow right past this early on and don't milk the dramatic tension for eight thousand episodes. So, yeah, it's way past time for Chloe to be clued-in. They've had something in mind for Ella from the beginning. The voices of the dead thing is a good guess, although it's hard to square that with her not solving any crimes on that basis. She's an interesting character and I hope we're not disappointed by whatever they reveal is the thing with her. Isn't it the case that it's not possible to count cards in Vegas, and has been the case for many years? (They shuffle every deal.) I heard Atlantic City isn't that way, though. Also, it's not clear whether Ella heard and saw the interaction before she shot the guy. Linda is my favorite character, along with Maz, and I wish they'd do something interesting with her. She was more fun when she was sexing around with Lucifer. In fact, she and Maz should have a fling.